We have arrived back in WA from Roxby and we are staying with my lovely parents for a couple of months until we are able to move back in to our home. Whilst I have been sad to leave behind our lovely little community it has been VERY exciting to see the range of alternative foods available here. So hopefully in the coming months (when I get back to my kitchen!) there will be a whole lot of new creations coming!! In the mean time, this is one of my current favourites – tweaked from another of my Mum’s recipes. Brush fillet with oil. Mix salt and spices and rub into fillet. Place fillet in a large baking dish and place in a preheated moderate oven for about 20 minutes. While the fillet is cooking, mix together the honey, water and aminos. Use half of this mix to coat the pears. Remove the fillet from the oven, turn the meat and add the coated pears to the dish and return to oven for a further 20 minutes or until the fillet is cooked through. 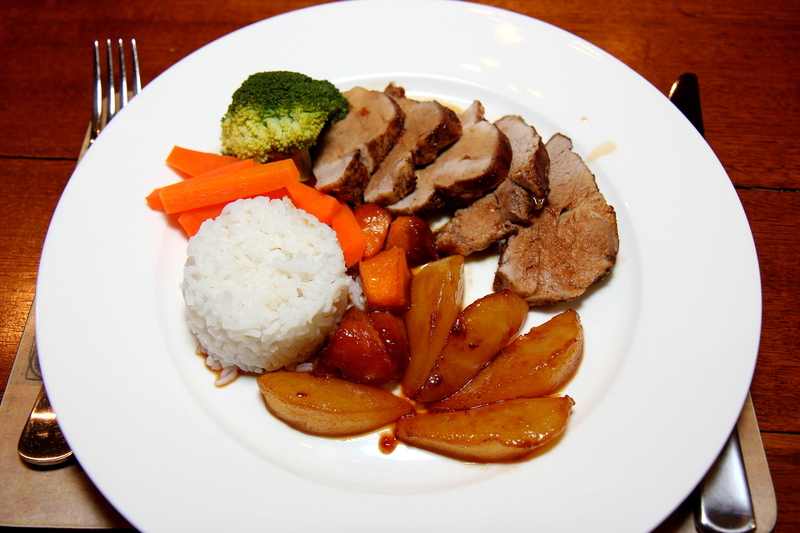 Allow fillet to rest for 10 minutes before slicing and serving with pears, rice and other vegetables. Drizzle the remainder of the honey mix over the meat, rice and pears. If your diet allows you can use sesame oil in place of the rice bran oil and soy sauce in place of the aminos.